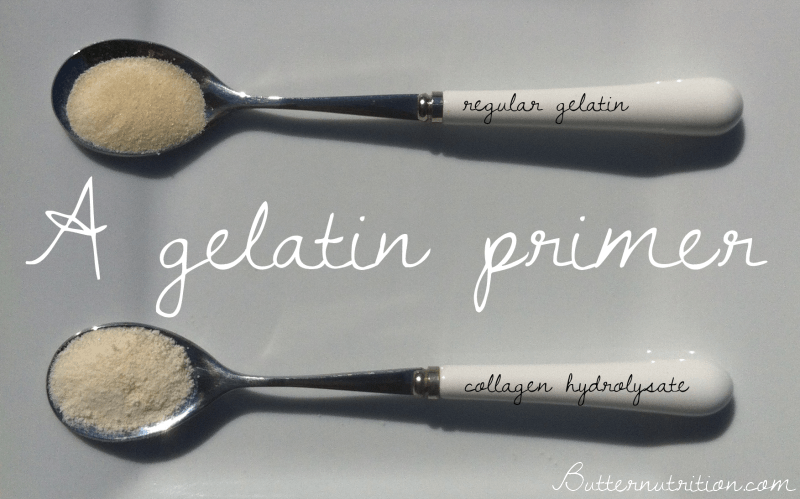 Home » Nutrition » Gelatin and Collagen Hydrolysate- What’s the Difference? Gelatin and Collagen Hydrolysate- What’s the Difference? By Catherine on August 19, 2013 | Last Updated April 4, 2016 | 4 Comments | Medical Disclaimer | This Post Contains Affiliate Links - I may receive a commission if you purchase through links in this post. Gelatin (also known as cooked collagen) is a wonder food with both anti-inflammatory and anti-aging qualities; it also helps to fill in the missing amino acids (the building blocks of proteins) in the standard American diet. According to Ray Peat, PhD, “The degenerative and inflammatory diseases can often be corrected by the use of gelatin-rich foods” (source). One of the greatest benefits of using gelatin is to help balance our amino acid intake. Because collagen makes up approximately 50% of the whole animal, gelatin can be used to help create a more complete protein balance in our diet. The standard American diet tends to be very high in muscle meats (such as beef, chicken, lamb and turkey), which, when it is not balanced by other proteins (such as eggs, fish, dairy, shellfish, organ meats), can contribute to inflammation over time (source). Gelatin has a unique and very non-inflammatory amino acid profile, primarily consisting of glycine, glutamic acid, proline, and alanine. Although these are non-essential amino acids (meaning your body can make them), many malnourished and over-stressed livers are not able to manufacture all the non-essential amino acids in the amounts demanded by the body. The liver needs an abundance of these proteins in order to keep functioning optimally, particularly to fuel phase 2 detoxification. This helps your body “take out the trash” in our toxic world, reducing inflammation! Although the most nutrient-dense source of gelatin is homemade bone broth (since it contains minerals as well), powdered versions offer a more convenient way to consistently get it into your diet. I suffer from rosacea flare ups so I have been consuming Knox gelatin and bone broth and kombucha. Which of these gelatins would you suggest? I think I digest god ok but I must have leaky gut if my rosacea flares any suggestions? Great Lakes brand can be found on amizon. The green can is the collagen hydralysite. It’s comes from grass fed cows. Perferred over Knox brand. I NOTICED FROM DOING RESEARCH ON AMINO ACIDS BETWEEN THE TWO; I WOULD BE BETTER OFF GETTING LESS METHIONINE AS I HAVE A PROBLEM WITH THIS AND IT IS VERY LITTLE IN B GELATIN THIS IS FOUND IN THE INFOMRATION ON GREAT LAKES WEB SITE..COLLAGEN HAS MORE METHIONINE WITH CAN CAUSE INFLAMMATION..WILL BE TRYING THE B BEEF SOON. Hi Can someone please explain to me what does Gelatine/collagen do inside your body to help with ageing. Does it help you with skin and bone?